Justin Anderson, who we’ve profiled before on Basketball Elite, has committed to Gary Williams and the Maryland Terrapins. We’ll be watching Justin more over the summer and getting more insight into the 2012 prospect. Coming out of one of the top areas in the nation for prep talent, Justin hails from the Baltimore/D.C. area. As we stated before when profiling Justin, he’s a gifted athlete and he should fit in well with the Terps’ style of play. 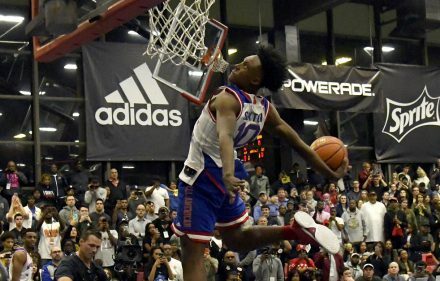 And because today’s recruiting environment is such that every player seems like they have a mixtape, here’s the obligatory video of Justin dunking on everyone in his path, in slow motion, over and over to the east coast beats of Anno Domini. But, hey, Justin is a solid player and he should be a great get for the ACC.